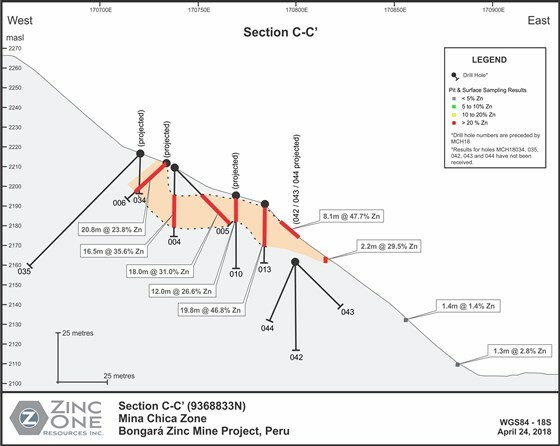 Zinc One Drilling Discovers New High-Grade Zinc Deposit at Mina Chica Zone, Bongara Zinc Mine Project, Peru | Energy and Gold Ltd.
Vancouver, British Columbia–(Newsfile Corp. – April 26, 2018) – Zinc One Resources Inc. (TSXV: Z) (OTC Pink: ZZZOF) (FSE: RH33) (“Zinc One” or the “Company”) confirms the discovery of high-grade zinc deposit located in the Mina Chica zone at the Bongara Mine Zinc project located in north-central Peru. The drilling at Mina Chica is part of the ongoing program that is targeting several areas of known high-grade zinc mineralization. This important discovery is based on additional high-grade results with substantial vertical thicknesses at Mina Chica. It is an exciting new area to be potentially included in the upcoming resource estimate and underlines the potential upward scalability of the Bongará Zinc Mine project. To date, assays for only 18 of 50 holes totaling 2,070 metres drilled at Mina Chica have been reported. The data for the remaining 32 holes will be announced once assays results have been received, checked, and compiled. The discovered deposit is open in all directions except to the southeast, which is defined by drill holes MCH18007, MCH18008, MCH18009, MCH18016, MCH18017, and MCH18018 as well as MCH18001, MCH18002, and MCH18003 (previously reported), even though a few meters of high-grade mineralization were encountered at or near the surface at these locations (see map in Figure 1. below). 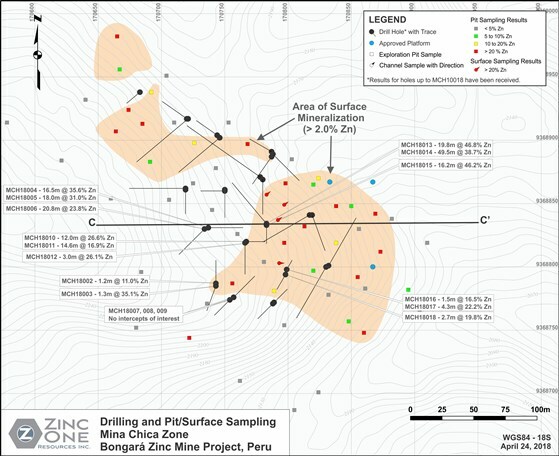 Mina Chica is one of three known zones of high-grade, near-surface zinc-oxide mineralization along a 1.4 kilometre mineralized trend that is being tested by this drill program. At Bongarita, which lies approximately 200 metres west of Mina Chica, all results from the 36 holes drilled have been reported. A second drill rig is currently drilling at Mina Grande Sur, which lies approximately 1.2 kilometres southeast of Mina Chica. Results from 11 of 75 holes, for a total of 1,509 metres, drilled have been reported to date. Significant results, including drill-hole orientation and total depths for Mina Chica, can be found below in Table 1. In addition, the map in Figure 1 shows the drilling and the surface/pit sampling at Mina Chica. Figure 2 is a cross-section that shows the key holes that define the discovery.